There is not one foundation retrofit system that can be claimed to be the best fit for every project or subsurface condition. Certain soil conditions can hinder installation and even prevent advancement of conventional underpinning solutions. Some of the more challenging soil profiles may include uncontrolled fill with construction debris or other large fractions, cobbles and boulders within native soils, extremely dense soil layers over weaker material, or karstic formations. When such conditions exist, drilled and grouted micropiles offer a cost-effective, deep foundation option capable of penetrating obstructions to bear within competent bedrock. In compression applications, capacity is achieved through end bearing and also skin friction along the interface of the grout column and the bedrock. In tension applications, only the skin friction contributes to the micropile capacity. Supportworks® retrofit bracket assemblies provide the load transfer mechanism between the existing foundation and the drilled and grouted micropiles. The retrofit bracket is supported against the foundation while the external sleeve and at least one pier tube section are driven with the portable drive stand and hydraulic cylinder. This is the same equipment used to install the Supportworks hydraulically-driven push pier system. The pier tube acts as an upper casing for the micropile while the external sleeve resists the bending moment generated by the offset load condition. The top of the uppermost pier tube is typically driven to be 4 to 6 inches above the top plate of the bracket. The micropile drill can be a small, stand-alone unit for maximum mobility in limited access areas, a small mobile unit capable of being mounted to a variety of machines, or integral with larger, track-mounted rigs to maximize efficiency and production. The mobile drill is often mounted to the Supportworks retrofit bracket and the micropile is drilled and completed through the bracket and pier tubes to ensure proper alignment. Supportworks® retrofit bracket assemblies are used most often in compression-only applications. However, modified cap plates and add-on assembly pieces can be used when tension capacity is required. 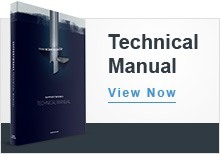 This method is ideal for sites where significant groundwater is not anticipated and the soils allow the borehole to remain open during drilling and for the time period required to complete the micropile. 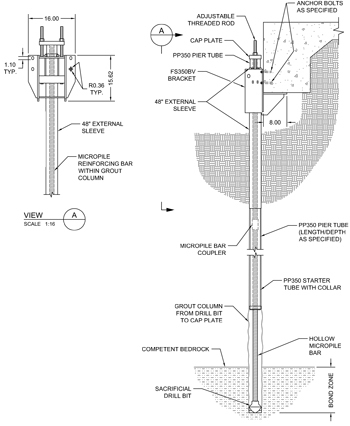 If caving soils exist above the bedrock elevation, additional Supportworks pier tubes can be driven ahead of the drilling operation to act as a casing. Upon completion of drilling, a solid steel reinforcing bar is lowered to the bottom of the borehole. 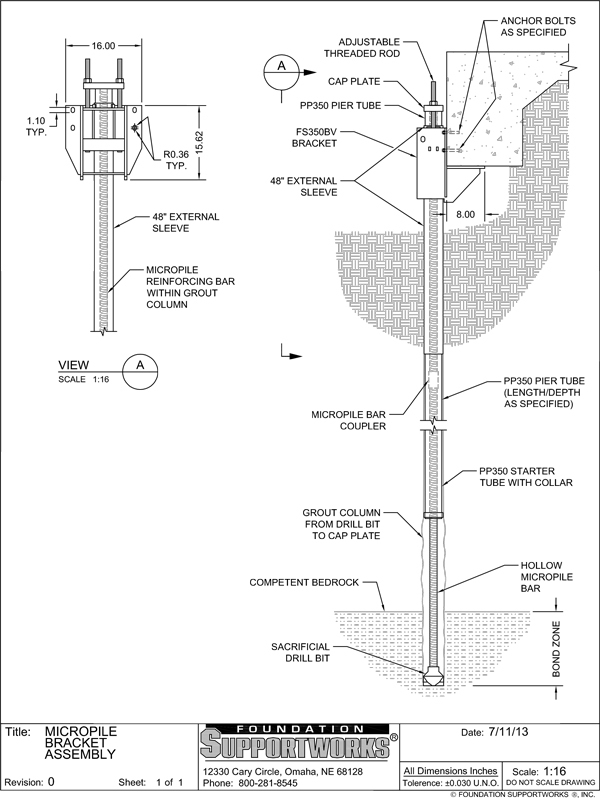 Couplers are used to extend the reinforcing to the top of the micropile. Centralizers are typically placed at a pre-determined spacing along the bar. Grout can be poured from the top, gravity fed down the hole with a tremie pipe, or pumped under pressure from the bottom up. A pressurized system to fill the borehole from the bottom up is typically used to displace any accumulated water and chase it out the top of the pile. Grout is placed to the top of the pier tube casing. This method is ideal for sites where an open borehole cannot be maintained due to caving soils and/or high groundwater conditions. The borehole is completed with a sacrificial drill bit connected to the end of hollow (threaded/ribbed/deformed) steel bar. The hollow bar serves as the drill rod during installation and then is left in the hole to be the micropile reinforcing. Low density flushing grout is pumped through the hollow bar and the venturi ports of the sacrificial bit as the pile is advanced to the specified depth or specified embedment length within the bedrock. The flushing grout keeps the ports open in the drill bit, stabilizes the borehole by preventing caving and water infiltration, and flushes cuttings out of the hole. Centralizers are again used to maintain clearance of the bar to the sides of the borehole.